If you're in the market for a spacious car, and your requirements for your next vehicle is comfort and affordable, the Toyota Highlander is just for you. Allow us to introduce the newly designed 2016 Toyota Highlander as one of the best three-row crossover utility vehicles on the market. It is becoming one of the most sought out SUVs this year, and after reading all that it's got to offer, you'll know why! As the one of the latest installment of spacious, dependable, and long-lasting SUV Toyota's line of Highlanders, the all- Toyota Highlander sets the extremely high. At Charlottetown Toyota in Prince Edward Island, we stock the latest models that Toyota has to offer, and we live to pair you and your family up with the one that fits all your and your family's needs while giving you our best deal possible. At Charlottetown Toyota in Charlottetown, CA, we proudly display all kinds of 2016 Toyota Highlanders of all colors, models and trims in our lot, and welcome all residents of Prince Edward Island with open arms, as we treat all our clients like family. Head on over to us at Charlottetown Toyota today! 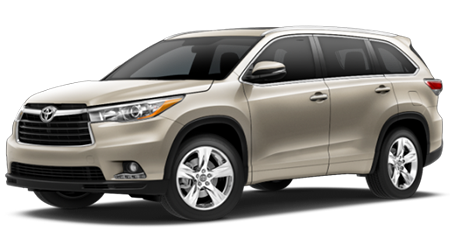 The 2016 Toyota Highlander does not fail to deliver with its powerful engine performance--mostly all the Highlander models are equipped with an impressive 3.5-liter V-6, with 270 HP and 248 lb-ft of torque; while also packed with the six-speed automatic transmission. You have the choice to make it the front-wheel or all-wheel drive, allowing for driving in any terrain that fits your needs. Whichever option you go with, you can count on it to be seamlessly smooth, fiercely energetic, and surprisingly fuel-efficient! On top of all that, this year's V-6 models will also include the impressive towing package! What this means, is that the Highlander is capable of carrying or lugging 5,000 pounds with ease. This capability comes in real handy when you have out-of-ordinary trips that require you to move heavy loads. The base models also include 2.7-liter four-cylinder that makes it fun to drive your car on trips whether it's a quick trip or cross country, you can count on the Highlander to take you there. The 2016 Toyota Highlander is designed an athletic build that resembles a fusion blend of SUV and truck, featuring a strong, chiseled almost maw-like grille that does well to aid airflow as well as command respect and attention wherever it goes. It also sports bright LED Daytime Running Lights to add style and visibility, adding to that effect. The XLE and Limited models feature integrated Chromtec roof rails, an awesome feature that keeps the Highlander's profile aerodynamic when not in use. And when it is, this is a great feature for families who go on outdoors trips often and need to strap those larger pieces of gear to their car without taken cabin space (even though there's plenty of it). Most models also have sweet tires, finished with gunmetal alloy! The XLE rides on 19" aluminum alloys built for optimized weight support and strength to carry you on your trips. The LE features split 5-spoke design 18" aluminum alloys. It's clear that Toyota has thought of everything to make your car look the best and drive equally as well. What's more, is that the 2016 Highlander also features an adjustable power liftgate that allows you to adjust how high it opens with a simple press of a button! This feature is particularly useful when you have a maximum clearance height to watch out for, or if you want to preset it so that it lifts just as high as you need it, the option is there at your fingertips. You can also use the "flip-up" rear hatch to grab things without even opening your trunk! The Highlander is as great on the inside as it is on the outside. Toyota has paid much attention to the 2016 Highlander's cabin refinement; each generation the Highlander has become quieter, more serene and overall nicer, because the latest Highlander feels like a complete luxury vehicle inside! The Highlander takes advantage of their improvements by combining extraordinary aerodynamic efficiency with its impressionable styling, aerodynamic wind reduction, allowing for better fuel efficiency, smoother driving… as well as a quieter cabin with thick acoustic glass damps powertrain noise, and insulation in the floor muffles vibrations, suspension chatter, and unnecessary tire noise. The soft materials on the dash are rich and velvety, the woodgrain is beyond amazing, if you have a bunch of a little gadgets for you and your family, the tray proves to be highly useful in helping you store them all easily and conveniently. Toyota aimed for the 2016 Highlander to an incredibly safe family car, and it definitely achieved its goal in doing so. Featuring the Safety Sense package combines Pre-Collision System, Lane Departure Alert, and Auto High Beams, to assist in doing whatever possible to get you out of trouble, and increase your road and driving awareness for all parties involved. Additionally, Toyota's Star Safety System implements an advanced suite of six safety features: Vehicle Stability Control, Traction Control, Anti-lock Brake System, Electronic Brake-force Distribution, Brake Assist, and Smart Stop Technology. Vehicle Proximity Notification and Lane Keep Assist will be extremely useful while on long trips and busy highways, but alerting you when there's a car in your vicinity and you need to slow down. And, in the case of an incident, the Highlander stocks seven airbags and available Safety Connect, which readily connects you with Toyota's 24/7 call center, and offers Emergency Roadside Assistance, Stolen Vehicle Locator, and Automatic Collision Notification. Toyota is notorious for their safety precautions, and you can rest assured you are in good hands in their Highlander. Now that you have all the right reasons to get your new Highlander, head over to Charlottetown Toyota! Anyone who's ready to jump into a new Highlander should visit us because we truly value our customers and want to make your car-buying experience amazing. At Charlottetown Toyota in PEI, we look forward to showing you our extensive selection, and finding the best fit for you. Stop on by our location at 1 Superior Crescent, Charlottetown, PEI C1A 7L3, we happily serve all residents surrounding PEI! The Highlander of your dreams is right here waiting for you so come on by to check us out today. We look forward to serving you!